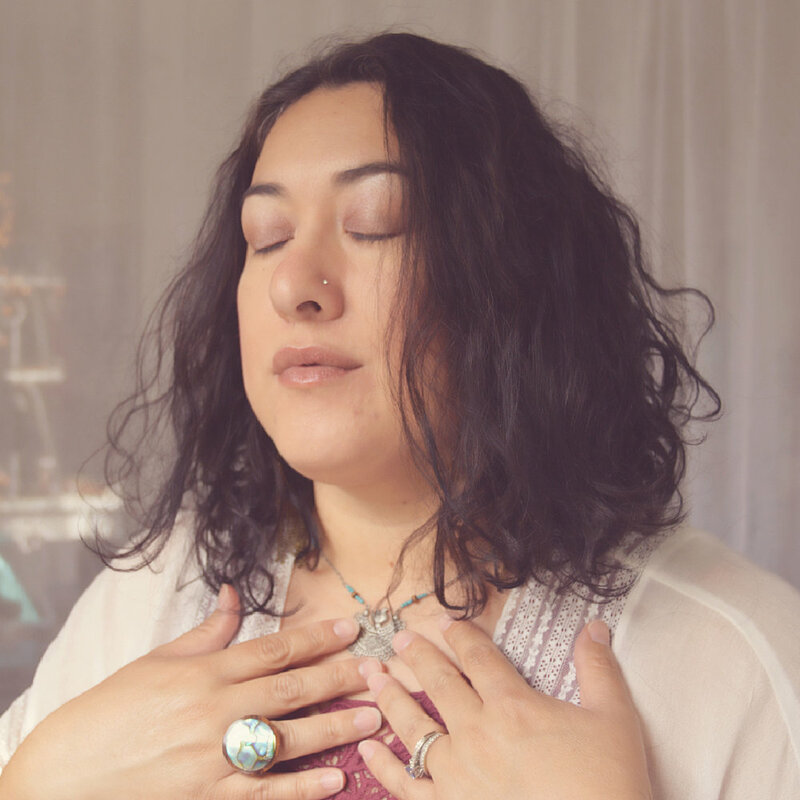 Melissa Fernandez is an inspiritrice and brave guide who shares a deep connection with nature, intuition and ritual. I've been following her creative process on Instagram over the past year and more recently her Studio Sessions video series. 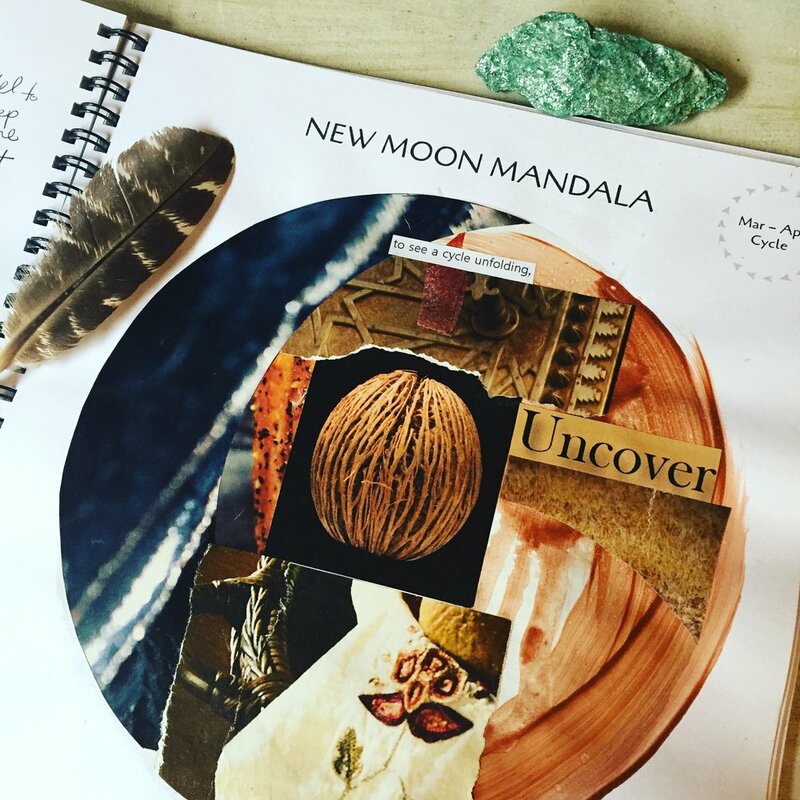 I am thrilled to share this window into her connection with the moon, healing and mandala making. As an artist, Melissa works with messy mixed media pieces and spins words to share her journey as a mystical soul. She naturally moves into curating the magic of daily life to keep the fire going for those who are ready to own their powerful stories and sacred expressions. April: Where are you right now? Where is the moon and what is she doing? Melissa: The Moon Mother; my guide and I are standing together hand-in-hand between the sprouting first quarter phase heading towards full illumination. Things have been stirred up. Such as new thoughts about old things, realizations, whispered aches, growing pains, vulnerable shifts, unanswered questions about my journey in life, new ideas about new pathways, delightful visions of feeling freer in myself. Half of me is aware, the other hidden; not quite visible. Yet, I do feel a glowing light inside growing each day almost ready to fully emerge. 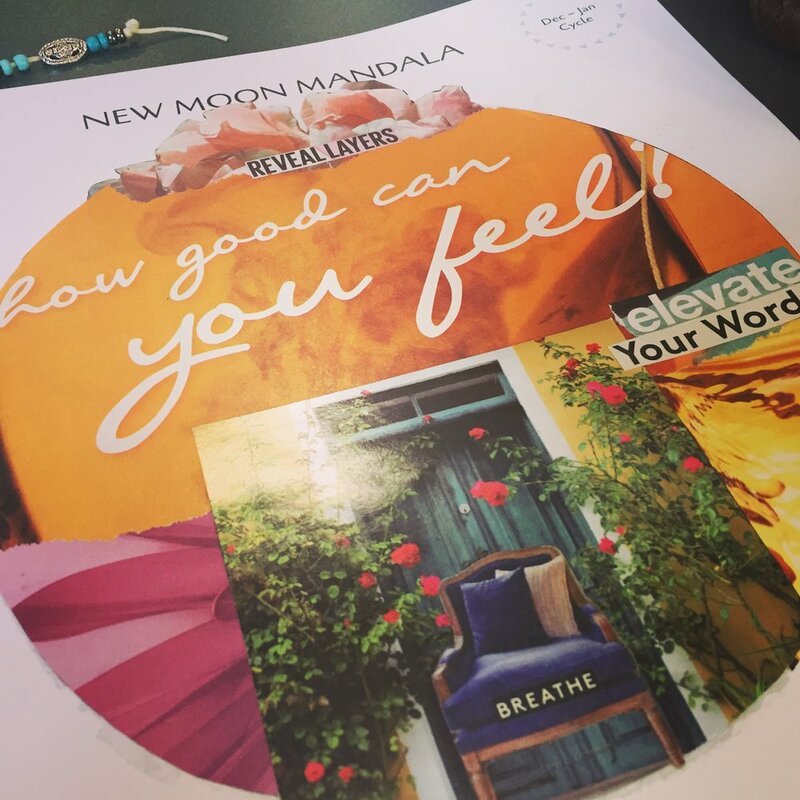 A: Describe your relationship to creating moon mandalas... Where do you begin? What materials do you like to use? M: Every time I sit to create a moon mandala I feel as if I am facing the unknown, the luminous or a mysterious space with a language of only two words: “yes” and “tell me”. That’s as close as I can get to what I hear intuitively. So, I arrive with hardly any plans and ask to be shown. I do my best to trust and listen and delicately unravel. This meaningful connection is something I look forward to each new moon. It’s nourishing and it’s also a vital piece in my creative practice. Collage art has always been a big part of my creative work because images and imagination are a language I am familiar with. Images can be enticing prompts to invite stories: allowing for messages and insights to arise. My approach in working with images is introspective which can sometimes result in abstract uses of color torn from magazine pages and other textured papers. My “loose” art-making seeks an expressive process of emotions vs. a recognizable result of a form or idea. Sometimes it looks like something familiar and other times it may not. Word play is also heavy in my mandalas because I house a poet’s heart and have a love for words. Mostly the words surface near the end of my completed mandala and at that point my intention magically arrives. A: What is one thing that helps you access your intuition? M: Ritual. I easily move into ritual or spiritual ceremony to set the tone. By opening up to these sacred spaces or vibrational states, it bridges my intuitive senses and creates a seamless connection to higher truths and deeper wisdom. A: In what ways does creating a new moon mandala enrich your life? M: Ever since I began closely mapping my journey along with the cycles of the Moon, I feel as if I’ve connected to something deep and outside of time. 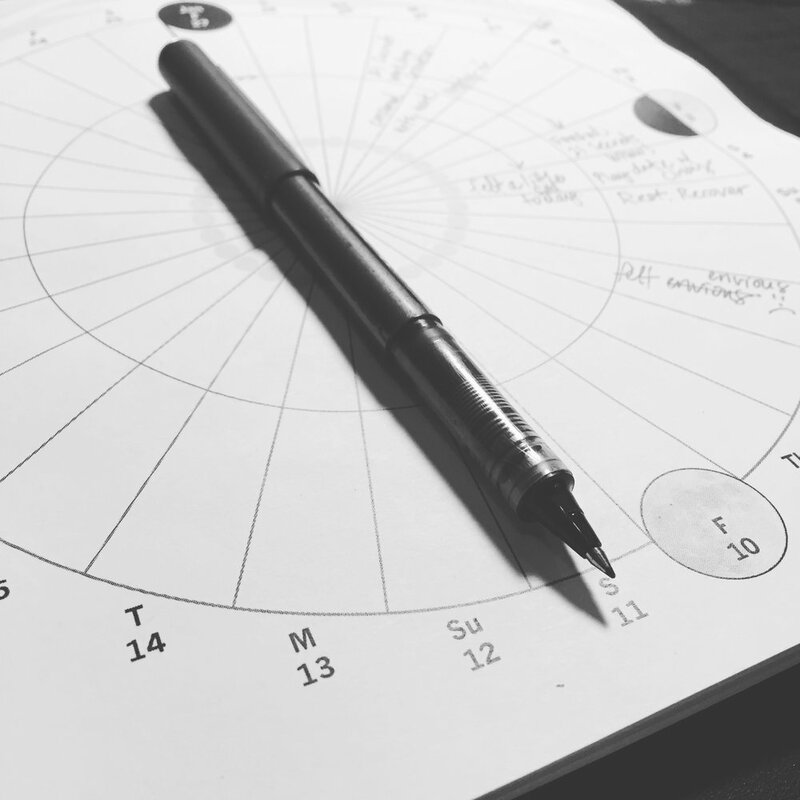 That may seem contradictory to say outside of time when I’m tracking using a lunar calendar, but it feels less like I’m chasing time and more like I’m making space. It’s given me a place to drop in, gently notice and creatively embrace a life designed from intention and alignment. It also helps me compassionately see myself in all my phases and cycles. A: How has your creative process evolved over time? M: I was awakened to my creativity when I begin my path in energy healing. I always had many artistic interests and creative hobbies, but there was a layer of awakening that hadn’t happened yet. I was blessed to meet an important person on my journey that for the next five years of my early twenties, mentored me in the intuitive healing arts. She also happened to be an artist and musician, so she encouraged me and gave me permission to explore anything that struck my creative interest. Gradually, my experiments with the mediums that truly spoke to me, I began to deeply understand myself through this creative process. Today, I find that the actual end result isn’t much of an interest to me, but rather the process unfolding is what fills me with life. When I created a series or body of work, it was revealing to look back and see my artistic evolution. I encourage all creative souls, to work with creative documentation or record-keeping. It’s fascinating to see the journey you’ve traveled. A: What fuels your creative spark? M: Nature. This natural world gives me language. It’s almost as if Nature is gently sitting, gazing at you lovingly and when you notice her, she blesses you with rich song and soulful reminders. Connection. Listening and sharing with others is so inspiring to me. The beloveds in my life are full of story, experiences and wisdom. In many ways, I believe as we share and connect we offer more pathways into the world. We create more space for our fellow travelers. These connections show up in my paintings and collage work, they inspire dialogues and feed the creative fire. A: Would you be willing to give readers some ideas or inspiration for creating their own moon mandala? M: Choose messy-beautiful before anything else if you struggle with perfectionism. Consider your Moon Calendar/Journal a private space where you have full permission to show up as you are at any given moment. The pages in that journal have an endless capacity to be there for you. She’s listening with a compassionate heart. M: I wish for you more moments of embodied self-actualization. When you see yourself in all the many ways that show up in your Being, in the light of your full potential…grab her and tell her how beautifully she is doing. I wish for you a lantern in the night of your darkest moments. The light that never diminishes. The one that waits for you when you are ready. The one that will guide you home. I wish for you more days of creative play devotedly in service of you and your precious sovereignty. You are a blessing. Lastly, I wish for you to find the unique song of your soul. I join you in rhythm and the movement of our Moon. A: Thank you so much for sharing your magic with us! Melissa Fernandez guides & facilitates spiritually led and expressive souls through workshops, online courses and other coaching programs. Her background is in energy medicine, the expressive healing arts and life coaching. She have studied various forms of vibrational healing modalities, have been ordained as an interfaith officiate/minister and initiated as a Reiki Master-Teacher. Printed copies of the 2019 edition of the limited edition Moon Mandala Wall Calendar are available in the shop. Order your copy today. It provides a structure for connecting to your inner wisdom and natural rhythms.